As the first line of care during any emergency situation, we realize how much you depend on your equipment and emergency gear to save lives, and facilitate patient transport and communication. Since 1903, Reeves has provided emergency medical, fire-rescue and fatality management First Responders with quality, US-manufactured equipment to help you provide expert care during emergency situations. Fuse state-of-the-art military shelter technology with a technologically superior combination HEPA filtration and HVAC unit to form a portable, all-weather solution to biological outbreak isolation. A lightweight, transportable command and communications solution to mobilizing a fully operational fire-rescue incident command post quickly and efficiently. 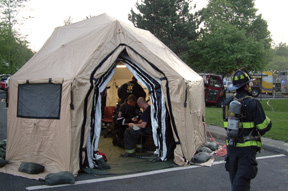 Whether you quickly need to set up a treatment or triage center, operate an incident command post or identify decedents during an incident, these mobile shelter systems provide complete solutions to your rapid response needs. Provides rapid patient immobilization while allowing personnel to maneuver through the narrowest of openings. Also can be used for air and water rescue operations. Transport your patient with ease. These stretchers are so compact that they allow the First Responder to carry many stretchers simultaneously when responding to an emergency. Heavy duty stretchers for larger patients and stretchers with body covers are also available. The Reeves Spine Board provides optimal support to patients with spinal or neck injuries, minimizing patient movement during transport. This versatile and customizable line of gear bags includes practical solutions for storing all or some of your gear. Whether its cots, blankets, pillows or towels, these supplies always come in handy during emergency situations. Reeves' 2 Lane, 2/3 Lane and 3 Lane DRASH First Response Decontamination Systems are fully operational systems that effectively provide NBC decontamination facilities for First Responders in the event of an emergency incident.